This contains a non-medicated HSE Medium Sterile dressing pad attached near to one end of a bandage. After placing the pad on the wound the longer end is wrapped around the injury and then tied to the shorter end to secure. Each one is sterile and comes individually wrapped. Order today for 55p each! 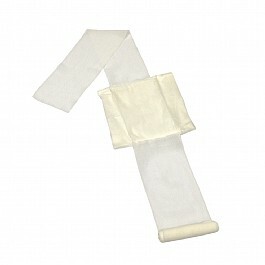 This contains a Medium HSE Compliant non-medicated sterile dressing pad attached near to one end of a bandage. After placing the pad on the wound the longer end is wrapped around the injury and then tied to the shorter end to secure. Each one is sterile and comes individually wrapped.